I'm back in Paris again for a few weeks, and today I'm excited to try something I haven't done before: a walk across the entire city. This morning I begin with a bus ride due west on the #63. I get off at the last stop, the Porte de la Muette by the Bois de Boulogne park, in the 16th arrondissement. Once this was the neighborhood for royal trysts and hunting parties; now it is more a gathering place for cars exiting the ring road, and joggers beating a path into the Bois. Every now and then my eye is caught by a distinctively different architectural style, such as this Art Nouveau building set amidst the standard Haussmann-style apartment blocks of the 16th. You can get a thorough grounding in French history just by paying attention to Paris street names, since each one refers to a famous person or event. I am walking on an avenue named after a hero of the resistance, a politician who refused to capitulate to the Germans. World War II is still alive on the streets here, if you stop to read the wall plaques. Before I know it, the Eiffel Tour is looming on my right. I veer past the Palais de Chaillot and through the Trocadero gardens, and head down to the Seine. I always enjoy seeing houseboats and barges along the Seine. I like the reminder that it's a working river, as well as being the visual center of this beautiful city. Earlier in the week I had painted in one of my favorite spots, along a quay a little further downstream. Next on my walk comes Pont Alexandre III, a most extravagant bridge. You'd be fully in your rights to accuse it of tasteless excess. I glance behind me, and there's the Eiffel Tower again. Hard to believe this ubiquitous symbol of Paris was once reviled by Parisians as an ugly blot on the skyline. To stay on the correct course, I need to leave the Seine, and head into the Tuilleries. This once royal, now very public garden stretches all the way from the Champs-Élysées to the Louvre. 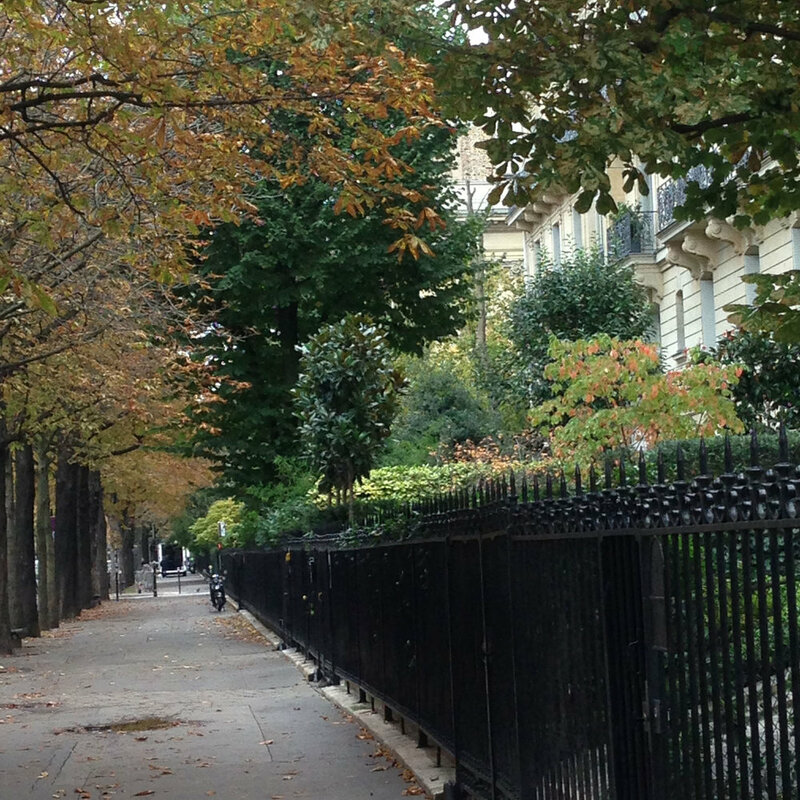 On this chilly autumn afternoon, the long allées are almost deserted. The chairs are empty of everyone but the crows. I cut a little north and join the rue Saint-Honoré, one of the old, old streets of Paris. It's nice to be surprised here by this wall painting of an over-sized Ingres beauty. Next comes Les Halles, the site of the still-lamented, mammoth glass city market that was torn down in the 1970's frenzy of urban renewal. The shopping mall and transit hub that replaced the market, which the mayor of Paris pithily described as a "a soulless, architecturally bombastic concrete jungle", are now being redesigned into a more pedestrian-friendly area. Meanwhile, I duck into the Église Saint-Eustache for a little quiet and rest. Or better yet, stop for a cappuccino and a sketch at the L'Absinthe Café. Then it's up and out again, and into the Marais. This is the district for trendy clothes, designer everything, and the very best falafel sandwiches. As I walk it becomes cloudy again, and the air grows chillier. Sighting the Art Nouveau metro sign near Place de la République warms me up. As Rue de Turbigo joins Rue du Temple in the 10th arrondissement, the character of the city changes once again. Instead of designer high heels, there's more a feeling of down-at-the-heels in this neighborhood. I cross into Belleville and the 20th arrondissement, and the transformation to a working class, multicultural neighborhood is complete. Narrow, steep Rue Belleville is filled with bright colors, crowds, noise, and hustle- and-bustle. And also filled with good smells! The Chinese neighborhood is just ahead. If I can keep going a little further up the hill, I'll find "Dong Fa", my favorite Chinese restaurant. Time for a big plate of homemade noodles, salt and pepper shrimp, and eggplant in garlic sauce. After this walk, I deserve every chop-stick of it. Dinner's over, but my hike isn't. There's one more long march to go up Rue de Belleville. And then I arrive at Porte des Lilas, just as the neon signs light up. I've reached the end of my eight mile (give or take), six hour (including stops to eat, drink and draw) west-to-east walk across Paris. Now for the north to south! Your comments are welcome. Please feel free to leave your name and website.